We are leading Manufacturer of Flow Totalizers and our product is made up of good quality. It accepts inputs 0~20 mA, 4~20 mA, 0~5 V, 1~5 V and 0~10 V.
We are leading Manufacturer of Flow Rate Totalizer and our product is made up of good quality. 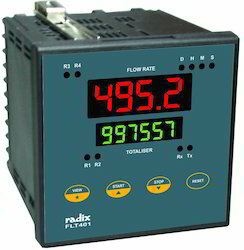 FLT601 is a microcontroller-based, user programmable Flow Rate Indicator-Totaliser. 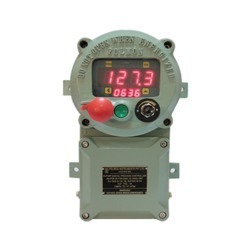 The operator can view and set the parameters using the 6-digit upper display and 8-digit lower display.It accepts inputs 0~20 mA, 4~20 mA, 0~5 V, 1~5 V and 0~10 V.
It has four relays assignable to either the flow totalizer (batch control) or to the flow rate (alarms). An isolated 4~20 mA (or voltage) retransmission output and an RS485/MODBUS RTU serial interface are also provided. 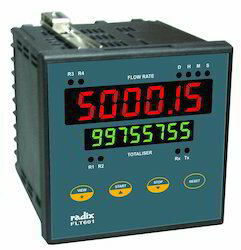 FLT601 is a microcontroller-based, user programmable Flow Rate Indicator-Totaliser. The operator can view and set the parameters using the 6-digit upper display and 8-digit lower displayIt accepts inputs 4~20 mA, 0~20 mA, 1~5 V, 0~5 V and 0~10 V.. It accepts inputs 4~20 mA, 0~20 mA, 1~5 V, 0~5 V and 0~10 V.
FLT401 is a microcontroller based user programmable Flow Rate Indicator-Totaliser. 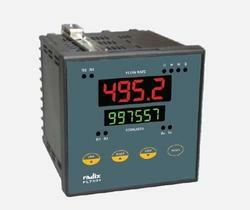 The operator can view and set the parameters through the 4-digit upper and 6-digit lower display. It accepts inputs 4~20 mA, 0~20 mA, 0~10 V, 1~5 V and 0~5 V. It has four relays assignable to either the flow totalizer (batch control) or to the flow rate (alarms). Looking for Flow Totalizer ?